Several university students from China's western region of Xinjiang have told the BBC that they are being banned from fasting during the month of Ramadan. The three Muslim students we spoke to the BBC did not want their identities revealed as they fear government reprisals for speaking about a sensitive issue. But they told us they were being forced to have meals with professors to ensure they were not fasting. Those who refuse to eat risk being punished by officials. One student told us, "If you want a normal life here then you'd better not fast." 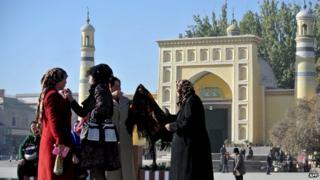 Xinjiang is home to the Uighur ethnic minority - most of whom are Muslim. Beijing blames a string of recent attacks on Muslim extremists and what it calls overseas terrorist groups. The BBC China blog is where our teams across the country will provide a flavour of their latest insights. We'll focus on the new and newsworthy, but also use our journalists' expertise to shine fresh light on China's remarkable transformations and upheavals. Most of the posts will be written or filmed by journalists in our main bureau, in Beijing, or in our other bases in Shanghai and Hong Kong. Please let us know what you think and send us your ideas. You can also use #BBCChinablog to keep up to date with our reports via Twitter. Many Uighurs, however, say the violence is being fuelled by Beijing's repression of their cultural and religious beliefs. The students who spoke to the BBC said that fasting was banned in all universities across the region. Several government departments are also enforcing a ban. One government hospital even got Muslim staff to sign a written pledge promising not to fast. Fasting during the month of Ramadan - when the faithful do not eat or drink from sunrise to sunset - is considered one of the five pillars of Islam. Traditionally, children, pregnant women, the sick and those travelling are exempt from fasting. As part of a propaganda drive, state-run newspapers in Xinjiang have been running editorials warning about the health dangers of not eating and drinking. This is not the first time the Chinese authorities have restricted fasting in Xinjiang. But with the restrictions coming amidst growing violence in the region, it is likely to exacerbate tensions. The students we spoke to at Kashgar Normal University said those Uighurs refusing to eat received official warnings, which could seriously affect their future career prospects. In some cases, students could even be denied by their degrees. "Most of us would like to fast," said one of the students. "But with the current situation most of us have decided against it."